Most diet programmes work at first. We lose a few pounds in a few weeks, but then life happens and the bad habits and the weight return. In this invaluable book, Judith Beck PhD offers the solution to break free from these common diet traps and keep the weight off for life. Judith Beck explains that when it comes to losing weight, it's not just about what we eat - it's also about how we think. To consistently eat differently, we must learn to think differently. Diets fail us because they don't offer effective strategies for overcoming the common traps - emotional eating, social pressure, dining out - that can derail us. Now, she and her daughter, Deborah Beck Busis, share the techniques they have successfully used with thousands of clients, revealing exactly how to overcome the thoughts and behaviours that have been holding you back. 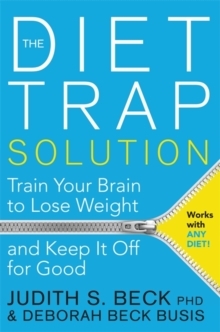 With The Diet Trap Solution, readers on any diet can learn to identify their specific diet traps, prepare for their personal triggers and create action plans to strengthen their 'resistance muscle' - making losing weight easy, sustainable and enjoyable.